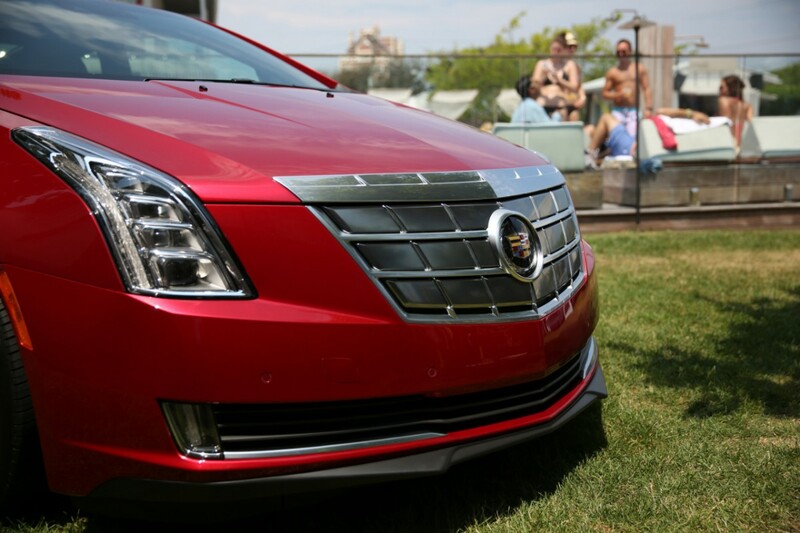 Ultrasonic welding, a high-tech manufacturing process used in the aerospace and medical industries, is helping ensure high quality for the new Cadillac ELR extended-range electric luxury coupe that goes on sale in North America in early 2014. Ultrasonic welding’s key advantage is exceptional and predictable quality and performance from one battery pack to the next. Every ELR battery, for example, has close to 200 ultrasonic welds. Each is required to meet stringent quality requirements, enabling Cadillac to offer an eight-year/100,000-mile battery system warranty. Short cycle times, low capital costs and manufacturing flexibility through the use of automation are other advantages of ultrasonic welding. 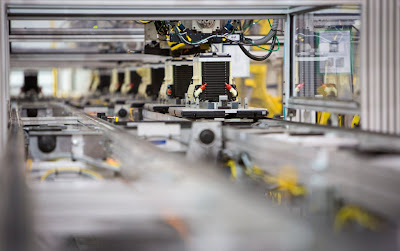 General Motors’ Brownstown Battery Assembly plant near Detroit, uses ultrasonic welding to join metal electrode tabs on ELR’s advanced 16.5-kWh lithium-ion battery system, and does it with a proprietary quality monitoring process. Brownstown uses an automated system to execute millions of these welds each year. Ultrasonic welding uses specialized tools called an anvil and horn to apply rapid mechanical vibrations to the battery’s copper and aluminum electrodes. This creates heat through friction, resulting in a weld that does not require melting-point temperatures or joining material such as adhesives, soldering or fasteners. An integrated camera vision system is used to shoot a reference image of the weld area prior to the operation to achieve pinpoint accuracy. Quality operators check electrode tabs before and after welding, and the system monitors dozens of signal processing features during each weld. 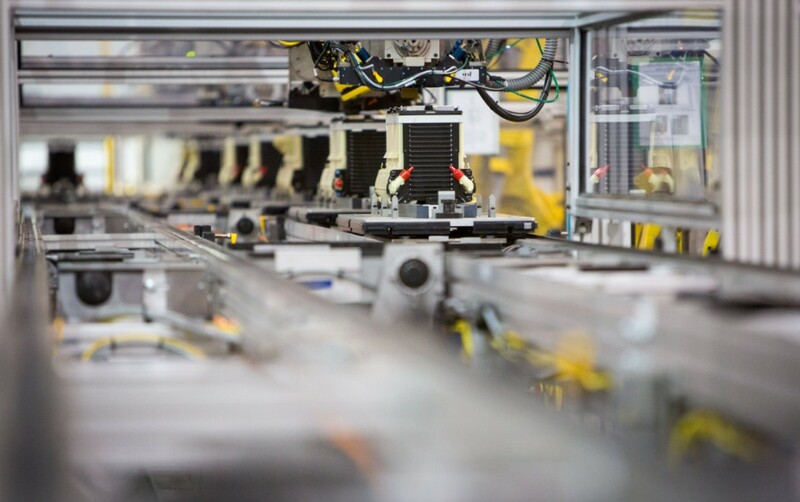 The battery-specific welding process is a result of collaboration among General Motors’ Manufacturing Systems Research Lab and Advanced Propulsion Center and the Brownstown plant. GM first applied the process on the award-winning Chevrolet Volt – its groundbreaking extended-range electric vehicle – and further refined it for ELR. The ELR’s T-shaped battery pack is located along the centerline of the vehicle, between the front and rear wheels for optimal weight distribution. The 5.5-foot-long (1.6 m), 435-pound (198 kg) pack supplies energy to an advanced electric drive unit capable of 295 lb-ft of instant torque (400 Nm) to propel the vehicle. Using only the energy stored in the battery, the ELR will deliver a GM-estimated range of about 35 miles (56 km) of pure electric driving, depending on terrain, driving techniques and temperature. The Cadillac ELR is built at GM’s Detroit-Hamtramck Assembly Plant, one of the few high-volume electric vehicle manufacturing facilities based in the U.S. Its battery pack is built from cell to pack at Brownstown and shipped to Detroit-Hamtramck for assembly into the vehicle.